Green had perhaps the greatest one-game offensive performance in major-league history on May 23, 2002. Playing for the Dodgers, he went 6-for-6 with four homers, a double and a single against Milwaukee for 19 total bases, breaking Joe Adcock’s record of 18 total bases. He was the Blue Jays’ first-round draft pick in 1991, played three games in the majors in 1993 and made the All-Star team in 1999, his final season in Toronto. He earned both the Silver Slugger and Gold Glove awards that season, and set a Blue Jays record with a 28-game hitting streak. The streak ended with a tie-breaking sacrifice fly in his final at-bat. 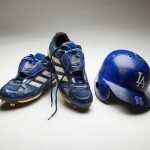 A free agent, he then signed with the Dodgers, hit 49 home runs in 2001 and earned his second All-Star selection. He twice hit 42 homers in a season, but had only one year in which he hit over .300 (.309 in 1999) despite a .291 career average. He finished his career playing two seasons each with the Arizona Diamondbacks and New York Mets. He topped 100 RBIs and 100 runs four times each during his career. In 1998, he had 14 outfield assists. On Sept. 26, 2001, Green ended a consecutive-game streak at 415 by not playing on Yom Kippur, even though the Dodgers were involved in a pennant race.